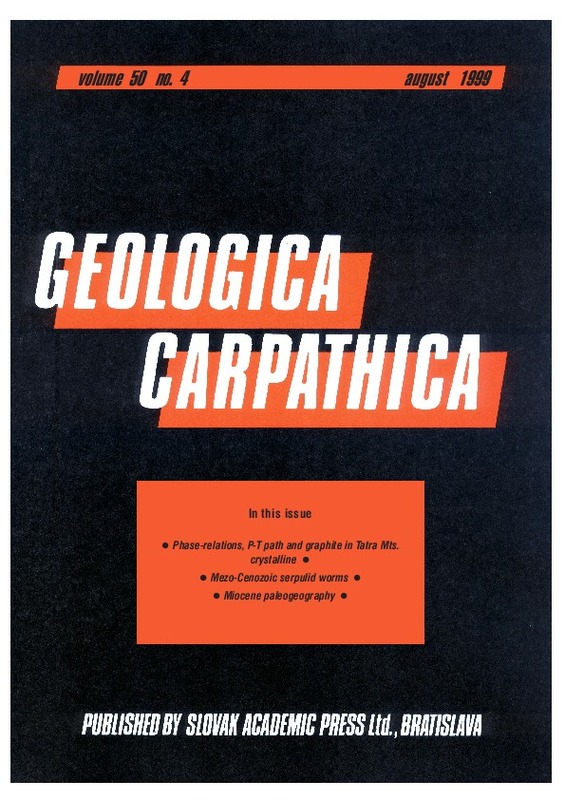 Abstract: Cordierite, as a product of Variscan regional metamorphism and exhumation, has been recognized in the migmatitic metapelites of the Western Tatra Mountains, Western Carpathians. The following cordierite-producing reactions have been deduced from reaction textures and phase equilibria in the system KFMASH: a) garnet decomposition according to the reaction garnet + sillimanite + quartz + fluid = cordierite during decompression at a temperature of ~700 °C down to a pressure of ~5 kbar; b) dehydration-melting of biotite by the reaction biotite + sillimanite + quartz = cordierite + K-feldspar + melt due to further pressure drop to ~4 kbar at a constant, or increasing temperature to ~750 °C; c) melt crystallization in the leucosomes according to the reaction melt = cordierite + quartz + K-feldspar + biotite + fluid, during cooling. Cordierite pinitization and its replacement by fine grained phengitic white mica and pale green Mg-rich biotite according to the reactions cordierite + sillimanite + K-feldspar + fluid = phengitic muscovite + quartz and cordierite + K-feldspar + fluid = biotite + sillimanite + quartz took place during subsolius retrogression at a temperature of ~ 600 °C and pressure of ~3 kbar. The origin of cordierite was also controlled by the local, more magnesian bulk composition of cordierite-bearing metapelites. The presence of cordierite is indicative of a high-temperature/low-pressure stage during the Variscan orogenic collapse in the pre-Alpine basement of the Western Carpathians. Abstract: Metamorphic rocks with graphite contents from 0.1 wt. % to 4 wt. % were analysed using Oxyreactive Thermal Analysis as a main tool with supporting X-ray and optical methods. Two generations of graphite were found in these rocks: 1. predominant graphite Gph1 of organic origin (graphitized petroleum coke); 2. hydrothermal graphite Gph2, in association with postmagmatic muscovite, albite and quartz. The P-T conditions of final graphitization for Gph1 were assumed as 7.5–10 kbar and 700–780 °C. The hydrothermal graphite precipitation took place at the temperature of 700–730 °C and pressure about 6 kbar and continued during cooling up to 400 °C and 2 kbar of pressure. Abstract: Rare worm tubes belonging to Mercierella Fauvel, Durandella Dragastan (formely attributed to Tintinnida) and to a new genus named Carpathiella comprising two species were described from thin sections of Jurassic, Cretaceous and Paleogene marine limestones. Abstract: The studies of the Neogene nannoplankton assemblages, identified in the Outer Moldavides, permited us: to date and to correlate the lithostratigraphic units developed in the Tarcău, Marginal Folds and Subcarpathian nappes of the East Carpathians; to define more nannofossil subzones and to observe a lot of nannofossil bioevents (FAD or LAD), which may characterize the chronostratigraphic units. It was remarked that the boundaries between the Egerian-Eggenburgian, Karpatian-Badenian and Badenian-Sarmatian stages can be characterized by the first occurrences of Reticulofenestra pseudoumbilicus, Discoaster exilis and Discoaster kugleri species. The boundary between the Oligocene and Miocene can also be approximated, in the Outer Moldavides area, by the first occurrences of Helicosphaera mediterranea. Abstract: The evolution of the Danube Basin is closely related to the extrusion of the Western Carpathian and Transdanubian Central Range lithospheric fragments from the East Alpine collision zone and to the Middle Miocene back-arc extension, associated with the formation of the Pannonian Basin System. Deposits of the Eggenburgian marine transgression, reaching the Danube Basin broader area through the Alpine and Carpathian Foredeep, can be correlated with transgressive depositional system of the TB 2.1 cycle of Haq (1991). The transgressive sequence passes upwards into highstand, neritic to upper bathyal sedimentation. The Ottnangian marine and part of the anoxic and brackish sediments represent the falling stage deposition. The lowstand deposition which can be correlated with the TB 2.2 cycle of Haq (1991) appeared still in the Ottnangian, during the compressive tectonic event resulting in closure of smaller basins. Later, during the Karpatian, sedimentation of transgressive and highstand depositional systems took place, still on the present Danube Basin northen margin (Blatne Depression, Banovce Depression). The high energy environment of the basin attained deep neritic to upper bathyal depth. The angular discordance between the Karpatian and Badenian strata, very common absence of the Late Karpatian and Early Badenian deposits (proved by micropaleontological data), as well as the presence of sediments of this age in the Novograd (Nógrad) Basin and its equivalents in the Zeliezovce Depression (Danube Basin) suggest absence of the marine TB 2.3 cycle of Haq (1991) in most of the territory. The whole area of the Danube Basin was flooded by the sea during the Middle to Late Badenian and Sarmatian. The sedimentation in the high energy environment of the neritic zone reflects two depositional cycles, which can be compared with the TB 2.4, TB 2.5 and TB 2.6 cycles of Haq (1991). The Badenian cycle started with the Middle Badenian rush transgression and highstand of the TB 2.4 cycle, followed by the Late Badenian higstand (SB type 2) and falling stage in the Bulimina-Bolivina zone. The Sarmatian cycle started by a lowstand characterized by Ammonia rich assemblages on the Badenian-Sarmatian boundary and was followed by a transgression and highstand which can be correlated with the TB 2.6 cycle of Haq (1991). The Late Miocene shallow water high energy brackish to delta-lake sedimentation in the north and deep water high energy environment in the central and southern part represent equivalents of the TB 3 Haq (1991) cycles. Abstract: Paleogeographical considerations on the development of the Paratethys and the Mediterranean during Oligocene and Miocene are presented in twelve time-slices. Plate tectonic activities and the collision of India with Asia caused the destruction of the Western Tethys Ocean in the Late Eocene. The Mediterranean and the intracontinental Paratethys basins came into existence as new marine realms. In the Mediterranean Basin open oceanic connections existed throughout the Oligocene and most of the Miocene. The Eastern Paratethys and the Central to Western Paratethys showed different marine conditions and changing connections most of the time. A first period with reduced salinity, anoxic bottom conditions, and strong endemisms occurred throughout the Paratethys in a short period of the Lower Oligocene (Solenovian, NP 23). It was followed by more open marine conditions with wide-spread clastic sedimentation (Upper Kiscellian, Kalmykian, NP 24). By the collision of Africa and Arabia with Eurasia, the seaway between the Mediterranean Sea and the Indian Ocean was closed in Burdigalian time, but a new landbridge enabled a distinct mammal migration between the continents (Gomphotherium Landbridge). During the Middle Miocene marine seaways between the Indian Ocean, the Mediterranean, and the Paratethys opened and closed intermittently. Finally, the marine connections of the Paratethys were strongly reduced, and gave way to the endemic faunal development during the later Miocene (Sarmatian to Pontian).